← Baywatch Rescue Boat- On the Cover in Germany! Makers of model ship kits face some existential challenges: Fewer young people have been raised with the model-building tradition (bodes ill for the future), and we baby boomers who do enjoy model building have many other distractions competing for our limited expendable income. Then there is the sticker-shock that comes with quality model kits, the time commitment for building models, and the doubts that many potential model builders have about their abilities to pull off a good build. But the UK firm DeAgostini may have the answer, and other kit producers may do well to observe and learn. First, DeAgostini has chosen a limited (but growing) list of popular subjects, allowing them to focus the needed time on complete product development. By “complete”, I mean not just the box full of parts, but thorough documentation of the subject and the build process, and assuring that the kit design can actually be assembled without the builder needing to re-engineer the whole thing (Billing Boats, are you listening?). Next, DeAgostini spreads the cost and the build itself over time, which makes the purchase a little easier to rationalize— they offer a subscription with 135 payments of £5.99 ($9.60) for the SotS spread over about 2 years. This seems easier than laying out $1300 in one chunk… it becomes almost invisible, like buying a Starbucks coffee every day! The subscription itself is novel, consisting of a magazine/practicum installment, along with the next few bits of kit to assemble. These arrive at your doorstep at the rate of one per week, which should easily allow you to keep up with the build without overwhelming your available time. I have signed up, and am looking forward to reporting more on the build itself in the near future. 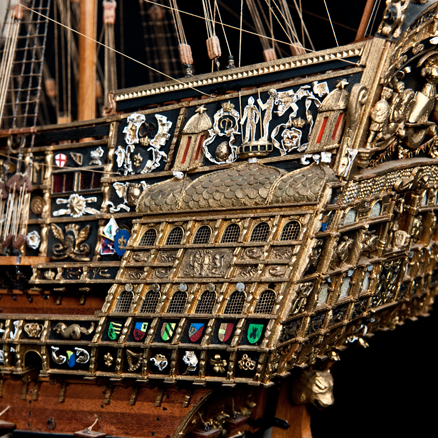 Depicts the famous gilded ship, launched in 1637 . With over 100 guns, the largest and heaviest armed ship of her day. It’s a big model, at 1100 mm long in 1:84 scale. Lots of labor saving parts: Laser-cut frames, presewn sails, machined metal castings, etc. The DeAgostini web site includes other content too: Other products, modelers’ forum, tutorials, Encyclopedia of Ships, and more. I’m glad it’s not just me being positive about this model. Personally, I think partworks are a good idea if they suit you. This is a complicated model even for experienced builders and having it broken down into thousands of easy steps makes it accesible to all. Who knows, once hooked, they may move on in the hobby ? Quite agree, Currently building HMS Hood with week by week building instructions and materials. Find the instructions superb and the magazine very informative. To build the Sovereign of the Seas without a clear and precise breakdown in the instructions can be very difficult even to an experinced craftsman. How much does shipping add to the $9.60 of each installment? Steve- Still working on that! In the UK, postage is included. To the USA, expect extra. Pingback: “Sovereign of the Seas”– Let the Fun Begin! « A Yankee Builds DeAgostini's "Sovereign of the Seas"